This new journal of poetry --42 JUICY PAGES of poetry-- is printed on the cheapest paper and clumsily stapled for your reading pleasure. In terms of materials and editorial labor, it's worth about 37 cents. But the value of the poetry it contains CANNOT BE CALCULATED IN MONETARY UNITS. Still, if you can't afford $5.00 to buy this exciting new record of the best and happiest moments of the happiest and best minds, WE UNDERSTAND. Just send what you think is fair. How many magazines offer you a deal like that? NOT VERY DAMN MANY, THAT'S HOW MANY. pay Anne Boyer (anneboyer at gmail dot com) via PayPal. Unsolicited submissions will be gaily defenestrated. Visit ABRAHAM LINCOLN: THE WEBSITE! Looks, in its present state, JUST LIKE THIS BLOGPOST! Yes, male and female, we get it, you have a Dada libido in your forty-something academic pants. No, not even the President who abolished slavery (ho- humeth) is above thy laughter and contempt: Long live the Google revolution, and stop thee if anyone can. Still, I, for one, am a bit disappointed, in a more, like, theoretical way. Why the hapless, melancholic Lincoln? Why not a closeted, headless Emerson, or a headless, naively religious James, or a dull, Trotsky-defending Dewey, or (in semiotically most clever move) a coke-lining, pederast Pierce--I mean, Peirce? After all, Flarf is the New American Pragmatism, and the mantle has been passed. Why not a little ironic off-with-their-heads fun with the acquired Fathers, as well? Surely, there are a few phrase hits that would lop their virtual noggins off, too? So, your check is in the mail, then? No, Kasey, I haven't sent a check. Given that we read together in Providence and had a quite cordial time together, I've kind of been waiting, three years now, for my complimentary copy. Or am I just chopped liver to you? I myself see a certain kind of ambivalence in the headless Lincoln that I find intriguing--it's very reminiscent of the Piss Christ controversy a decade and more ago. Do we read the headless Lincoln as an attack on Lincoln, or as the implication that the thinking which he symbolizes has been removed from American life? Is Lincoln himself an unambiguous figure? If you remember, the artist of Piss Christ suggested that his work was not an attack on the cross, but a protest about what had been done in its name. Of course, the issue is, like that of the headless Lincoln, that there remains a fundamental ambiguity in the image that resists either of the two readings, at best implying that they exist in tandem. But would a more purely polemical art be a better gesture, or better art? An image of, say, an American general holding a gun to Lincoln's head? I'm not sure about that, but wonder what others think. Well, this seems part of the appeal of Flarf, especially for those who practice it: The writing, by very nature of its appropriative "aesthetic," is empty, so pretty much any ironic value can get dumped into it (or subtracted) after the fact. And this makes Flarf, despite its smirky bad boy/girl pose, a perfectly safe way of making "poetry"--one that's nicely adapted, in fact, to an increasingly professionalized field. But I doubt that will happen anytime soon: When so much depends on a buttered piece of bread beside the white chickens, there are limits to impropriety. An interesting take, Kent, and very helpful to me. I myself don't see how the appropriation is "empty," since the language (or image, in this case) is significantly meaning-full. This is one of the implications of all appropriative art, isn't it, that the material that you've borrowed and reshaped inevitably has content? 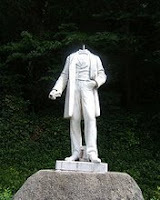 Nor am I sure I see, in any simple sense, how the headless Lincoln is "ironic." The two, very definite possible meanings I can find--an attack on the concept of Lincoln, or a suggestion that the ideas he represents have been eliminated in American culture--don't have an ironic relation to each other, but an ambiguous and troubled one. And the point of my question was, would it be a better work of art if the ambiguity was taken out? That was why I brought up my own example: would it be a better work of art if a contemporary American general was unambiguously pointing a gun at the head of Lincoln, in which case the work would be obviously polemical? Not sure how my comment is helpful to you, since you seem to have more or less missed the point. My point is that Flarf, by its own admission, takes its material from others and does its business, thus. There is in this sense an open--I would say, convenient--distancing of agency and ethical responsiblity, a wish to stand above one's material, to pare one's fingernails above the dirtiness of what is beneath the Author... This is everywhere in evidence in the work. It is present in its method and flourescent in its ontology. If you doubt this, I would point you to the discussion around Mike Magee's controversial poem, The Asian Glittering Gay Guys, though I can't remember exactly now the title. Here is where some of these issues were brought to the fore and where the poets of this group were asked to answer some foundational questions. And it's instructive that even as subtle and brilliant a critical mind as he (I think Magee is the best of the Flarfists, actually) was reduced in that discussion, responding to his numerous critics--as were his associates--to being able to say almost nothing in self-defense, except, in a most revealing moment (Magee), that the raw material of his poetic constuction is always "neutral" and that ethical matters don't begin *until* "the poem is finished." This is why Flarf's irony is suspect, ethically, and why your comment about not seeing how a headless Lincoln is "ironic," whatever inflection that irony may be given in opportunist retrospect, is just plain silly. The irony is that the "irony" has no real intended ethical direction. And it's why the banal Ambiguity you speak of is ulitmately a cop out. Again, check out the discussion I mention, and see how the collective was reduced to being able to say, in face of the charges, pretty much zero. i take upon my [uncut(e)] head the full responsibility for the choice of the image. of course. Thanks, Kent. Believe me, I do understand you, and I have indeed heard before the argument you're making. I just don't feel persuaded by the blanket nature of the condemnation, which is itself a fascinating read. Of course, I haven't always felt persuaded by some of the flarfists arguments regarding their works either; I don't think that they do stand "outside" the work they've borrowed. But for me that claim, which only some of them have made, doesn't ruin the work itself. I've tended to try to read the works, at times, outside of the context of some of the theoretical comments that have been made about them. Far from an empty gesture, it seems to me that the headless Lincoln sparks a lot of further thought. But I won't waste anymore of your time--all best to you on the journey, and I hope you don't encounter too much more disappointment. The point I am making is that in test cases, like the Magee poem, the Flarfists want to move outside of the rules of the game they have created and make a new (though embarrassingly older) claim: that the "text itself" is the issue. And they can't have it both ways. When the rubber of adolescent, warmed-over dada meets the road of the actual political, or social, what have you, it behooves them to step up and give some axiological account of the teenage-like pose. It's that when they have tried, when push comes to shove, they have little to say, except that they don't deserve--wah wah--to be held up to critique or (god forbid) satire. My argument here is not in the abstract. I have spoken to numerous undergrad and grad students in poetry who tell me (for the most part with a measure of contempt) that Flarf is the hip thing where they are, that young students are adopting the idea and that it's all the latest rage. There's something about it that makes it "cool" to the younger set just starting out. All sorts of problematic things lend themselves to being cool, of course. So maybe the matter goes beyond this or that comment box. The excerpt from Murat Nemet-Nejat's recent comment to Mark Wallace (in previous thread) should be nominated for most singular blog comment of the year: growing up in Turkey, religious mania, door to dor sales of electrolux vacuum cleaners, Donne's buzzing fly, Lincoln's missing head... It's all here, in the poetry of Murat's inimitable prose! "I am perfectly aware of the insanity of the religious mania, its suppressive urge. Mark, I also understand your urge to escape such environment. After all, that's why I left Turkey where I was the son of an economically privileged Jewish family and came to The States where I had to work as a door-to-door electrolux vacuum cleaner salesman for a while.Today, because my wife is religious and gets sustenance from it, I go to the synagogue occasionally but can not stay there for more than hour. My state reminds me of a John Donne sermon (meditation?) where he says he is obsessed by the buzz of a fly when he is trying to pray. On the other hand, is Hutchins (?) in his boozy white suit any less insane, not to say disgusting? I think the discussion between you and Kent around Lincoln's missing head is related to what we are discussing here...."
What can I say but thanks, coming from someone whose opinions I value greatly. In the middle of responding to the post on the sacred--or to this post--a friend of mine who looks exactly like Flavor Fav walked in and wanted some commentary on his new clothes and shoes. Given they are bright orange all I could figure is they might help prevent getting hit by a car or being "accidentally" shot by mistake at night--distinguishing marks can a difference. At any rate--my comments to this post are mixed in with the ones to the Sacred/Translation post which follows this one. in my other post--i ask what if there were headless bodies of people killed in the african and arab countries?? ?--what if there were a lincoln five dollar bill drenched in blood and heroin from afghantistan?? i think it is like the Great Communicator's question re the question about the debt--Isn't Lincoln big enough to take care of himself? 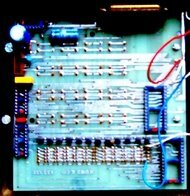 am enjoying the comments here and just wanted to point to an essay i wrote just published in JACKET 33 regarding flarf. it's called "My Michael Magee & the Frontier of Democratic Symbolic Action" -- it touches on some issues here. I did see your Jacket essay and I refer to it, via a remark by Mike Magee on the poet's "ethics," in one of my comments above. We would have some differences of opinion on the matter of Flarf, I suppose, but your article is excellent and a really important contribution to the discussion. One thing we *would* agree on, though, I'm sure, is that Mike Magee is a brilliant writer, scholar, and editor, aside from being a swell and down-to-earth chap.